Sorry, there are currently no consumables available for this scanner. Oops - we don't appear to have a video for the PL812. Why not take a look on YouTube to find one? The Plustek PL812 ADF document scanner, a new member of Smart Office series, offers high-speed scanning capability and compact design, making it a perfect solution for workgroups and other decentralized scanning applications. The Plustek PL812 ADF scanner provides a maximum scanning speed of 8 pages per minute, optical resolution up to 1200 dpi, and permits identify of large quantities of documents at high speed by built-in Auto Document Feeder (ADF) that holds up to 50 pages per time. 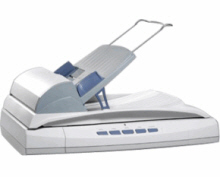 Besides, it can be used as regular flatbed scanners easily, which adds ever more versatility to satisfy all your needs. This Plustek PL812 ADF scanner is a truly versatile document scanner that puts up outstanding value and high performance, makes it a perfect business and SOHO solution, and enables businesses to achieve high levels of productivity.